I set up IFA Consultancy in 2004 to provide compliance consultancy services to Independent Financial Advisers. I had ten years’ experience as an IFA, both in the bank and private sector, prior to this role as a compliance consultant. I therefore know how to help with the compliance needs of small IFA firms. Today, 70% of my clients are independent financial advisers and I have worked with many of them for several years. IFA Compliance is my specialism. I am qualified to Diploma level and I am a pension transfer specialist. I am also a qualified T&C supervisor because of my CII AF6 Management and Supervision qualification . I have additional qualifications in pensions, trusts and mortgages. 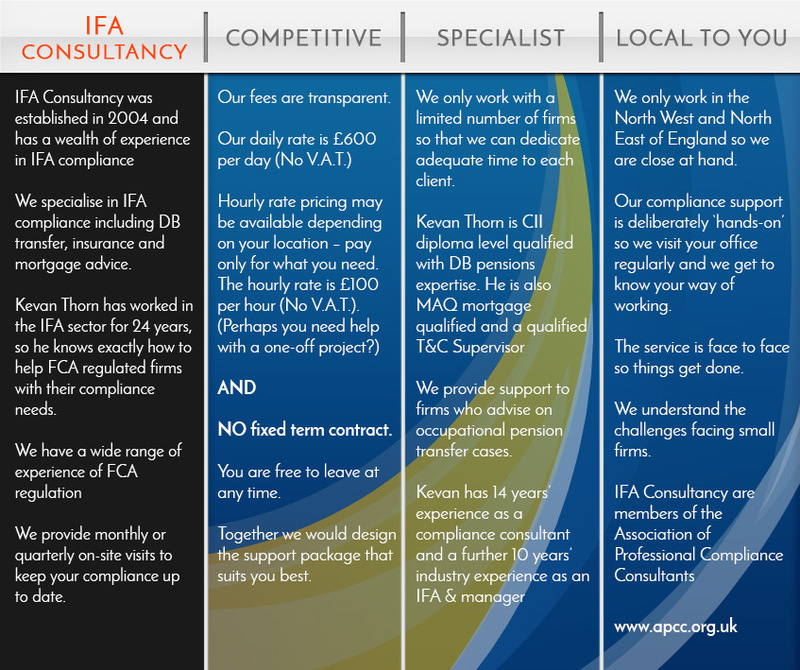 I can help with the full range of FCA Compliance for IFA firms. As part of my initial visit we will work together to assess your needs and then I would provide you with a 6-month compliance support plan. If there are urgent development points then we would prioritise those. For instance, you may have a certain compliance issue that has prompted your enquiry, anything from recent contact from the FCA, new rules that you are unsure of, or just a complaint you may need advice on. At the first of my regular visits I will then identify the items that I will take responsibility for leaving you with more time for your core activity of advising clients. The bespoke compliance support will provide you with monthly on site visits which will take care of all of the elements of your compliance regime.